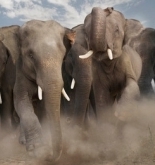 The Elephant Watcher News archive for the month of July, 2011. In July, the contest for the Republican nomination for president entered the dead zone, a period of relative inactivity. No candidates joined or departed during the month. Nor were there any debates or (obviously) contests. Nevertheless, there were a few important developments that took place during in the July doldrums. Michele Bachmann surged in the polls, particularly in Iowa. There was increased polling of the early primary states in early-to-mid-July. That polling suggested Bachmann was in first in Iowa, and second place (to Mitt Romney) elsewhere. The polling came to a halt in mid-July, however. Bachmann got increased visibility and media attention, but she was not able to establish herself as a credible, electable candidate. Nor was she able to do anything to ward off the increasing threat of a Rick Perry candidacy, which would surely encroach upon her Tea Party support. The other important development was, of course, Perry. Though he made no official announcement entering the race, it became increasingly clear that he intends to run. Taking advantage of the Republican voters' desire for someone to fill the void, Perry gained support under the radar. On the Intrade markets, he entered direct competition with Romney for frontrunner status, while Bachmann's numbers waned. Meanwhile, other candidates attempted to get some attention, but they could not. Without any debates to appear at, and with voting day so far away, few in the country paid much attention to the Republican primary. Despite increased focus on the possibility of a Perry run, no one was able to challenge Chris Christie's status as the one potential candidate who can unite the Republican establishment and Tea Party. The only obstacle in Christie's path is the question of whether he will actually enter the race. Across July, Elephant Watcher's calculation of the odds was unchanged: Christie maintained a huge lead with a 66% chance of winning the nomination.